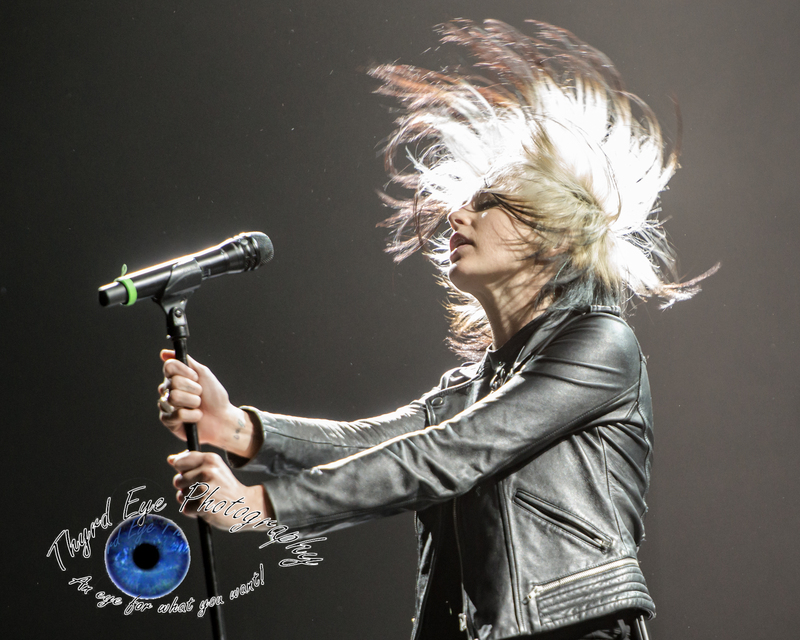 Phantogram performing at the Peabody Opera House in Saint Louis pic by Sean Derrick/Thyrd Eye Photography. 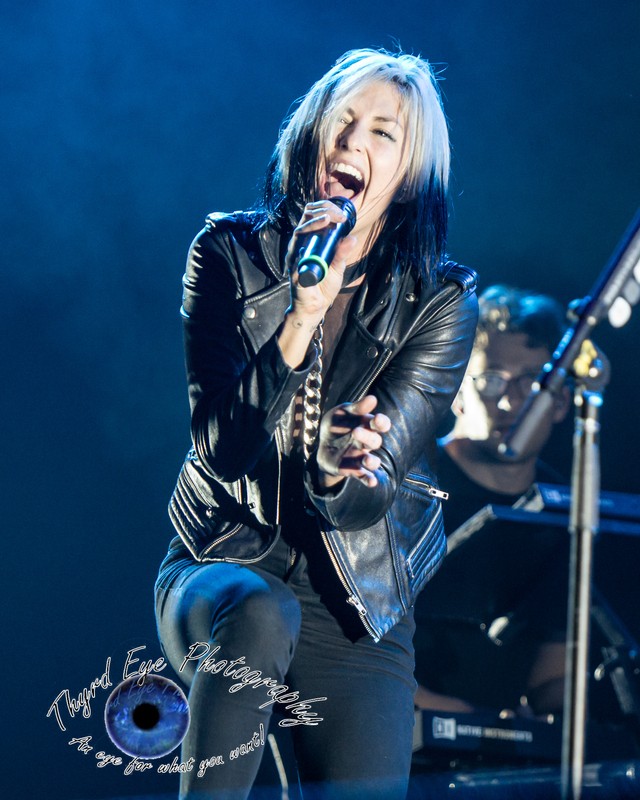 The electro-pop duo known as Phantogram performed at the Peabody Opera House Tuesday night, opening for The 1975. While The 1975 are an established act with millions of fans this review will focus solely on Phantogram’s set. On tour to support their latest release Three the duo (vocalist/bassist/keyboardist Sarah Barthel and guitarist Josh Carter) gave the Peabody Opera House crowd a glimpse into their world. It was a trippy angst-driven ride into a dreamy catacomb of dark thoughts and wicked experiences, accompanied by Carter’s swirling guitar riffs and backed by a keyboardist and drummer with large looping beats. But the experience was supposed to be much more visual than it was. The first four songs were to be played behind a scrim, a thin curtain that should have projected 3D visuals amid projections of the band. However, for whatever reason the scrim was not deployed. Of course, that meant the projections and images weren’t either. The band would have to rely on their music to impress. Playing a ten-song set that started with the rhythmic “Black Out Days” from their 2014 CD Voices they showed perseverance while Barthel immediately commanded attention with her dynamic and grandiose stage presence. Phantogram has been an act since 2007 (though Barthel and Carter have known each other since junior high)and have spent the majority of their career with experimental alt-rock. Three has shown the growth the band has taken and the ability to keep growing and not sounding the same. This ability combined with their impressive stage presence will surely catapult the band to bigger heights. The show Tuesday was only their second ever visit to Saint Louis (the other being a 2012 performance at Lou Fest). With a great tease from a 45 minute set I am very much looking forward to a full set in Saint Louis where the band would headline and show their wares without the constraints of opening for someone else. Hopefully that time will be this spring at one of the many club venues Saint Louis has to offer. Their current tour takes them on a jaunt to the west coast , Australia, the south and back up the east coast by the end of January. If you get a chance check them out, you will not be disappointed. Don’t forget to check out the full photo set after the setlist.